Rock & Metal 4 You: CD-Review: VOLBEAT - "Outlaw Gentlemen & Shady Ladies"
CD-Review: VOLBEAT - "Outlaw Gentlemen & Shady Ladies"
The Danish metal band VOLBEAT are back with their fifth studio album "Outlaw Gentlemen & Shady Ladies". When I look at some review-ratings it seems like this album is controversial discussed. Some say it's too commercial, but I think commercial doesn't always mean it's bad. Read my opinion on the whole album below. Yeah, I'm a little bit late with this album, but I've to say I didn't know this band before. For sure, the band name was familiar to me, but I never listened to one of their albums. Maybe this is due to this crappy name. Volbeat sounds like a dance act and later I thought they would do just modern/alternative rock, which I really don't like. So the whole career of these guys passed me by ... until now. The good thing is: I can review this album in a more objective way. I can't and won't compare it with their previous stuff. 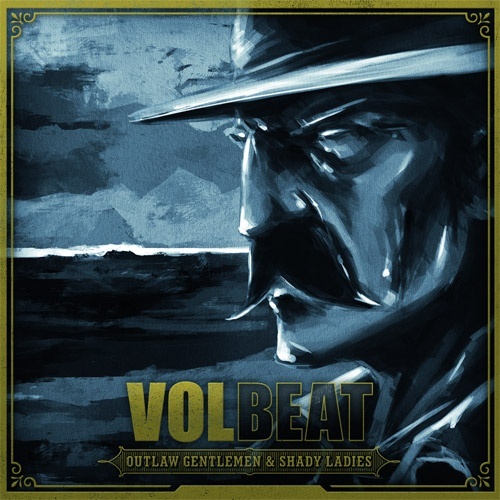 Volbeat play a mixture of metal in the vein of Metallica, traditional Hard Rock, Country, Blues, old time Rock'n'Roll (Elivs Presley, Johnny Cash) and for sure - modern rock. This whole concept sounds quite fresh to me, because all these elements fit together perfectly. I've rarely heard this style before. Also I like it very much when metal bands give their sound a special note, for example Elvenking with their folk elements. And this is the same with Volbeat - they add to most songs a great wild west feeling and this sounds special and unique to me. So soundwise I was really surprised. The record starts with an intro that will take you back to a time where Cowboys and Indians ruled the land, very cool and interisting. By the way: most of the songs tell the story of different wild west legends from fictive and also from real persons. So after the intro the first song "Pearl Heart" starts and Volbeat totally hit me. This ist just an amazing, catchy opener with all the ingredients I mentioned above. "The Nameless One" follows this path of a very melodic hard rock number. With "Dead But Rising" we get a more riff-oriented metal song with a pounding rythm section. This is underlined by a top notch production by Rob Caggiano and Jacob Hansen. This guy made a perfect job on the last two Pretty Maids records and the production of "Outlaw Gentlemen & Shady Ladies" is nothing more than outstanding - very clear, but also with enough punch and balls. "Cape Of Our Hero" was the first single of this album and it also sounds like that: a very radio-friendly rock-track, which reminds me a little bit at the American band Hinder. Yes, it sounds very commercial, but I don't know why everyone thinks commercial means bad. If commercial means they add more melody to their songs and make the songmaterial more accessible I haven't a problem with that. It's still high quality music and songwriting and this is my opinion on the whole album. It has a commercial vibe, but I don't understand why people blame Volbeat for that. So, now we get to the song wich is a favorite of many Volbeat-fans: "Room 24" with King Diamond on guest vocals. Sorry guys, but I hate this song. This is the only total failure for me on that album. This is due to the fact that Volbeat use less melody and rely more on screaming and riffing without a real destination. What is the climax of that song? It hasn't even a real chorus. "The Hangman's Body Count" also needs some time to stick in your head. After this Volbeat deliver one hit after another. I really can't point out one of the following songs, because they are all perfect with very cool melodies. "Lola Montez" is such an amazing feel-good-tune and "The Lonesome Rider" (feat. Sarah Blackwood) is a stunning wild west ballad. I can't praise the guitar work enough on all tracks on this album . I love the guitar-sound on every single track. It is so melodic, but also crunchy. In my opinion the guitars are very important here, just listen to the song "The Sinner Is You". This track lives from its stunning guitar parts. Very well done! "Doc Holiday" is a fast, pounding metal anthem again. Believe me, this one will keep your head banging throughout the entire playtime. "Our Loved Ones" closes the album in a very good way. This is a beautiful metal ballad. I'm still totally stunned. I didn't excpect such a strong album from this band. For sure, I don't felt comfortable with the voice and singing style of singer Micahel Poulsen in the beginning. He has a powerful voice, but he often sings in the same way without much emotion. But I got used to it. I can't help myself, I could listenining to "Outlaw Gentlemen & Shady Ladies" again and again, because it makes so many things right and it never gets boring. Each year you've one of those albums, which come out of nowhere and then totally hit you. "Outlaw Gentlemen & Shady Ladies" is one of them and it will definitely find its way in my top ten list of the best albums in 2013. Each rock and metal fan should be pleased with this record, because Volbeat deliver a great mixture for Hard Rock, Metal, Melodic Rock and even Country fans. The whole work is fun to listen to (except one song), so I will keep an eye on this band in the future. Highly recommended!! !